Modern computer networks are divided into several types: global (VAN) and local (LAN). When you connect the computer to a network, it is automatically assigned an IP address, that helps identify virtually any device, which was connected to the network. But thanks to what is happening? The whole process is based on the concept of DHCP. This abbreviation is usually denoted by Dynamic Host Configuration Protocol, i.e, host system is configured by connecting to a remote server. Currently the Protocol is supported by default for the most part operating systems and eliminates manual configuration of network settings for the connected computer. 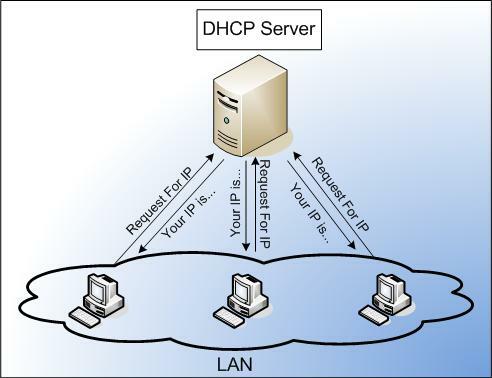 DHCP is based on the use of "client-server" model. Mastering the basic foundations of the protocol can eliminate various problems, that can occur with the network. DHCP is used to obtain the desired configurations according to TCP / IP Protocol, outgoing from the primary server. other information, which is necessary to connect to the network. It is to receive it on the user's computer and serves as the protocol. For a more complete understanding of, What is DHCP should be added, that its functioning is based on the principles of information exchange, used in this process. In the different messages used by the protocol, such as: DHCPDISCOVER, DHCPOFFER, DHCPREQUEST and a number of other, which is a response to a client request to the server, or at the completion of the use of network address. The entire protocol of the process consists of several steps, wherein, they are set by default. In the first stage when you start your computer, or connect it to the network is sending DHCPDISCOVER request. For this port 67 It uses UDP protocol. After receiving the request the server sends back a message DHCPOFFER, contains the required configuration parameters, requested by the client. Besides, automatically filling in values of the MAC addresses in the CHADDR field. If you find a server in a completely different subnet, Relay agents are used, responsible for the delivery of the message. In this case, the transfer is carried out through port 68. In the next stage, the client is formed DHCPREQUEST message, represents the response to a DHCPOFFER, at the same time indicated, All configuration parameters are taken they. During the passage of this stage, Customers come all the answers to his questions. The next step is the final phase and helps to understand, What is DHCP. During its implementation, the server receives a DHCPREQUEST and responds with DHCPACK, which informs the client that, that he can use IP-address. This occurs after closing the network connection as configured.